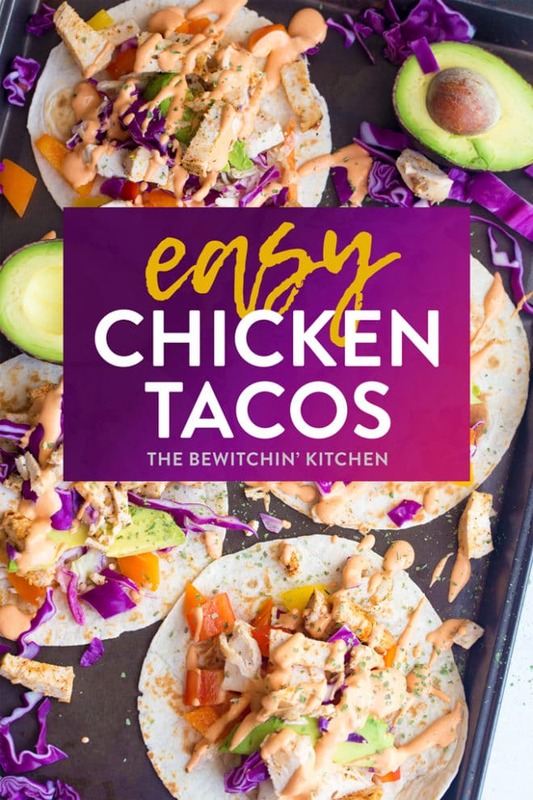 There is nothing I love more than easy chicken tacos. The best part about this recipe? 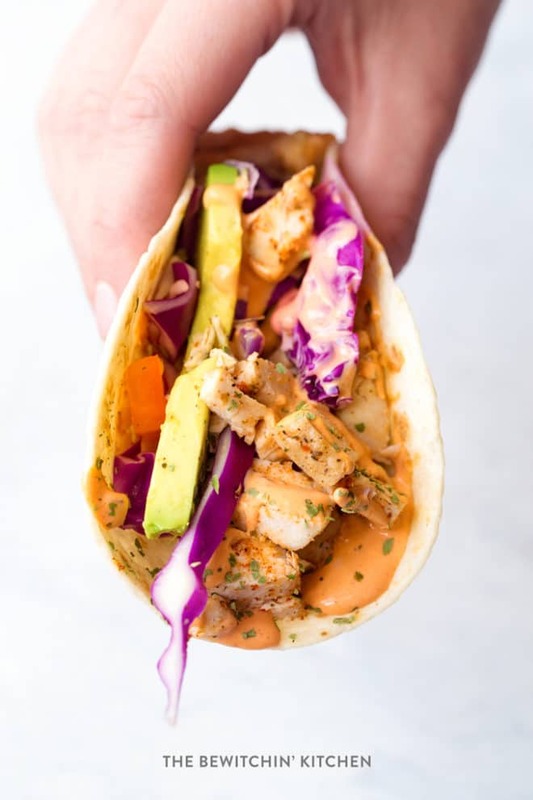 You can throw it together with leftovers from the night before, or start from scratch with a zesty chicken taco marinade as a base, inspired by a favorite – chicken street taco recipe. Disclosure: I am participating in the Chicken Farmers of Canada campaign managed by SJ Consulting. I received compensation in exchange for my participation in this campaign. The opinions on this blog are my own. Search the recipe sections over at Chicken.ca. Follow them on the following social profiles: Facebook, Twitter, Instagram, and Pinterest. This month my friends at Chicken Farmers of Canada are challenging me with creating a budget friendly recipe. I have to be honest, this is not my area of expertise. When I make a meal plan, I make what I want and don’t factor budget in. I always cook what I feel like and work out the budget in other areas of my life. So this was very challenging for me. Originally, I wanted to make a Southwest Chicken Spaghetti Squash Casserole, but it’s 34 degrees (93.2F for my US friends) and I don’t have air conditioning. Needless to say, the oven is not turning on until Mother Nature figures out her stuff. It’s not easy to be mindful of a budget when it comes to cooking, so I wanted to think about ingredients (or dishes) that I could stretch out and that are filling. In addition to a budget recipe, I wanted it to be healthy (which works in my favor since vegetables are both filling and healthy). I marinated and grilled a bunch of Canadian Chicken on Saturday (Canadian chicken costs less compared to most meats and you can make it, even more, cost-effective by using chicken thighs instead of breasts). This fed us grilled chicken on Saturday night, plus gave me easy lunches and quick no cook dinners for the remainder of the week. I tossed together my favorite coleslaw salad recipe. By doing this I had a side for our bbq chicken and a pickled inspired topping for our tacos. On Sunday I made tortillas, chopped up vegetables, and whipped up a quick sauce. With a package of Canadian Chicken, a salad, and some vegetables I easily had two meals for my family with one go. Why Canadian Chicken? Not only am I supporting Canadian Farmers, but I’m providing my family with chicken that is grain-fed, free of hormones, and steroids. 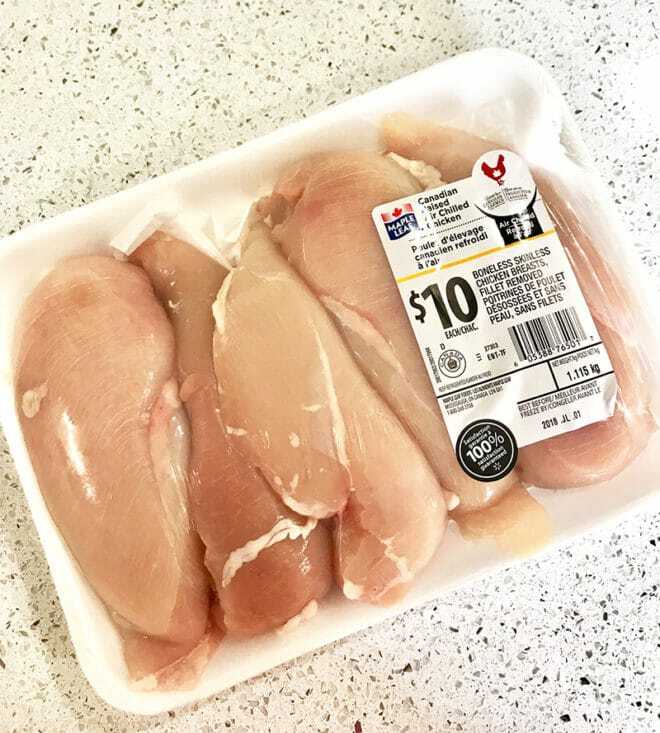 Plus Canadian chicken is raised here in Canada according to nationally-set, mandatory food safety, and animal care standards. You can find Canadian Chicken by searching for the Raised By a Canadian Farmer logo (seen in the above photo). If you’re not a fan of a soft taco, you can crisp them up in the oven. I used chicken breast because it’s a personal preference, but you could use chicken thighs for another low cost chicken option. 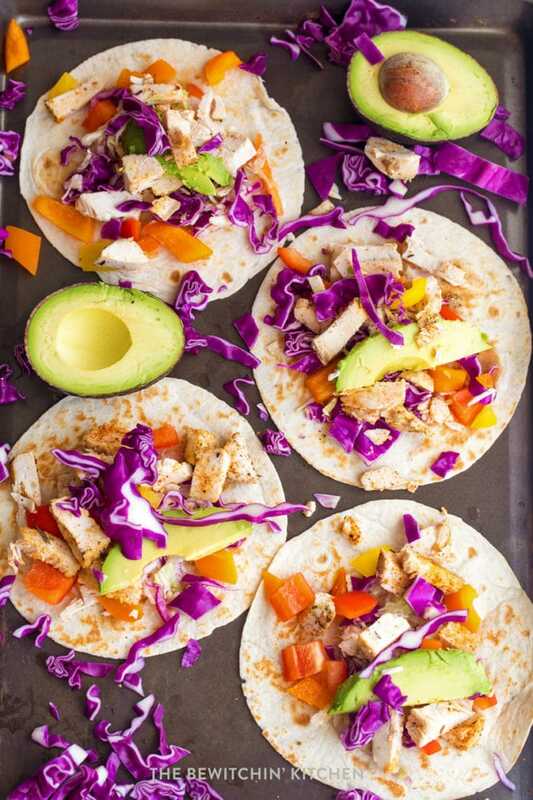 Randa’s Tip: Throw the chicken in an Instant Pot or slow cooker for easier prep, and this makes perfect shredded chicken tacos! How many calories in a chicken taco? I have the full nutrition information at the bottom of the recipe card, but for two chicken tacos it’s 480 calories. 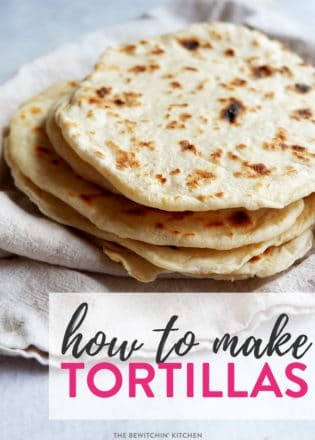 Please keep in mind that this is dependent on the kind of tortillas you use (store-bought, homemade, etc). In addition to how much avocado and vegetables you use. 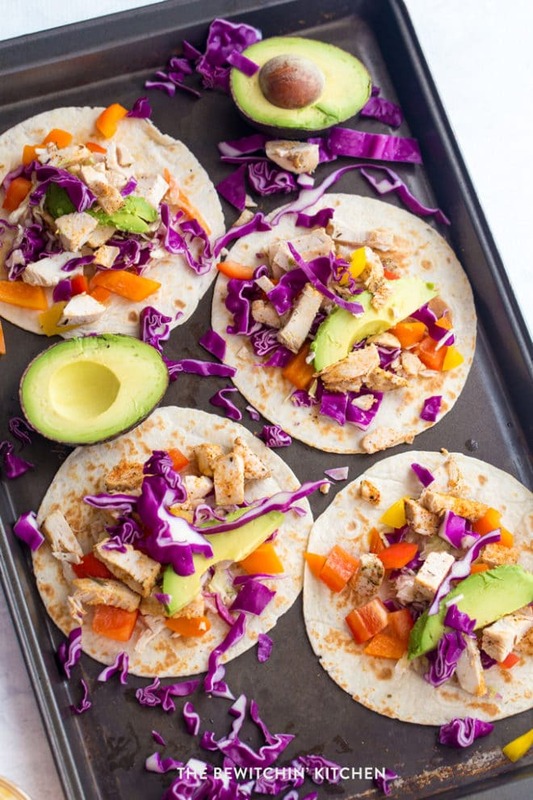 The best part about these easy chicken tacos? They’re so fast to put together! This benefit my sister and I when we ate them on Sunday (to say we get hangry is an understatement). 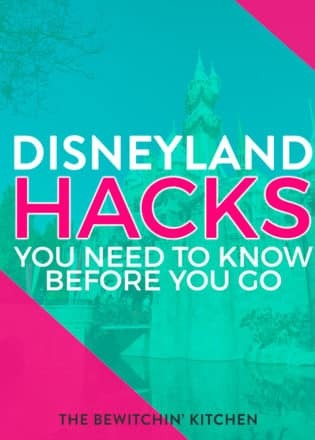 If you have everything prepped from the night before, or earlier in the day – it takes 5 minutes to put together. You can use leftovers from a roast chicken. In just 5 minutes, you’ll be sitting down with your family to eat. How’s that for a leftover buster? 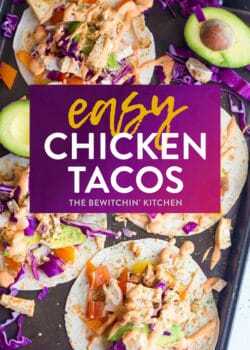 These easy chicken tacos are so darn simple and SO GOOD! You can either cook up some marinated chicken or use leftovers with this healthy budget chicken dinner. Use grilled chicken or shredded from the Instant Pot or Slow Cooker/Crockpot! 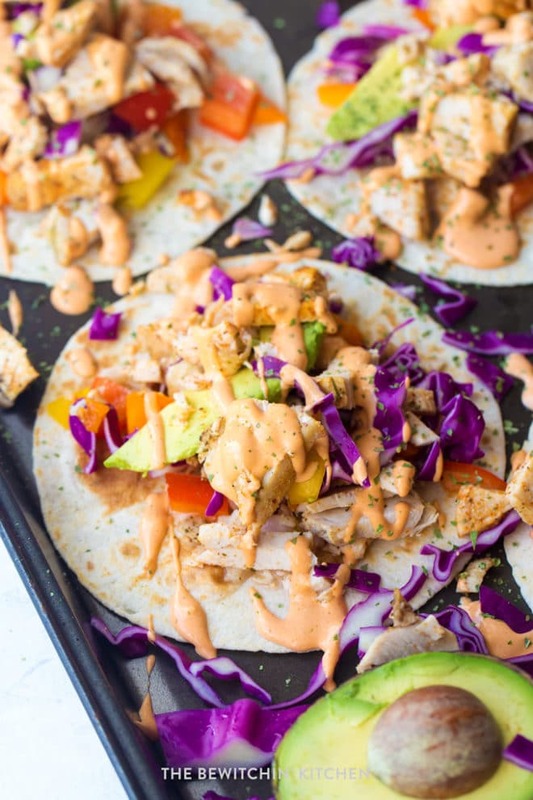 Since all the ingredients are already cooked and prepped, putting together these chicken tacos is so easy! Add the rest of the ingredients in whatever order you want. 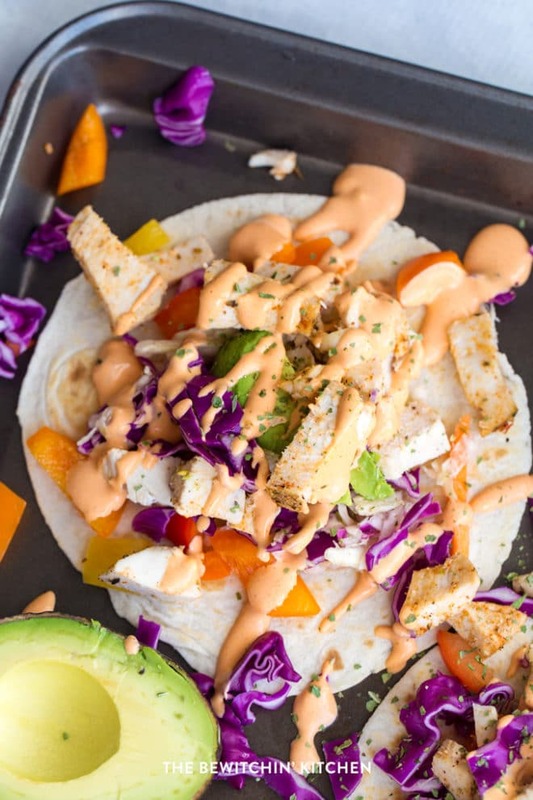 I did slaw, chicken, vegetables, a small slice of avocado, and drizzled with the spicy mayo. Combine both the mayo and hot sauce together. Use a spoon to drizzle over your tacos, or place it in a squeeze bottle. Put the marinade ingredients together in a bowl. Add chicken and marinade for at least an hour. Grill for 8 minutes on each side, or until chicken reaches an internal temperature of 165. Weight Watchers Freestyle: 7 per taco when using coleslaw and sauce and a corn tortilla for 2 SmartPoints - Mission Corn Tortillas are only 1 SmartPoint each and a good recommendation to make. Those look super tasty! I love dishes like this because they’re perfect for using up leftovers, too. OH that spicy mayo sounds so delicious! I would love to try that on tacos! I’m liking the sound of these. We like have a taco night every other week and this might be a good change of pace. This basically looks amazing!! I love the pops of color and I bet they taste so good!!!! I love that you used leftovers for this! It’s really a beautiful dish, for sure. LOVE that you used slaw on them, too! We typically have leftover chicken, so this would be a perfect way to use it. 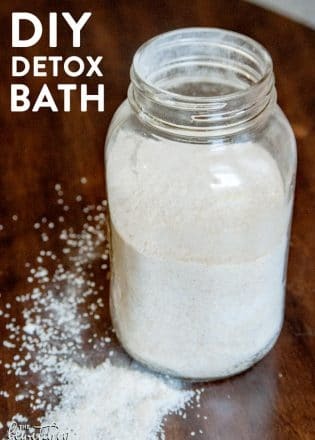 Quick, easy, delicious, and no waste! 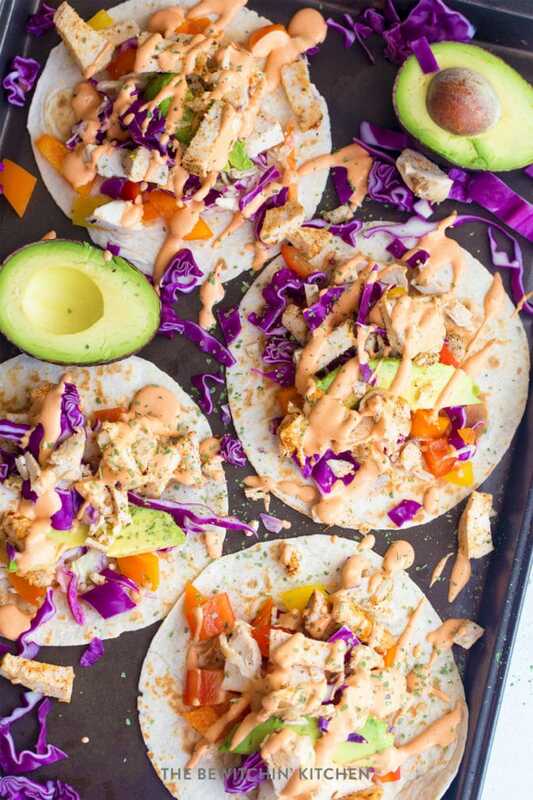 These tacos look like they would taste incredible. I absolutely love chicken tacos more than beef so I need these! Tacos have become a favorite in our home lately and especially great because my husband volunteers to make them! 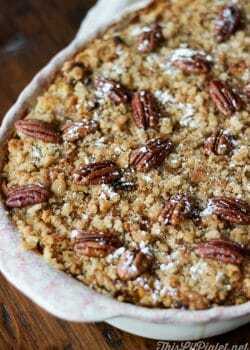 I love how easy it is to make them from leftovers! I have a bunch of chicken leftover and that’s what we’re doing for dinner tonight! THese look so good. I love just about any kind of taco and chicken tacos are definitely some of my favorite. We make something very similar with the leftovers from a Sam’s Club rotisserie chicken! 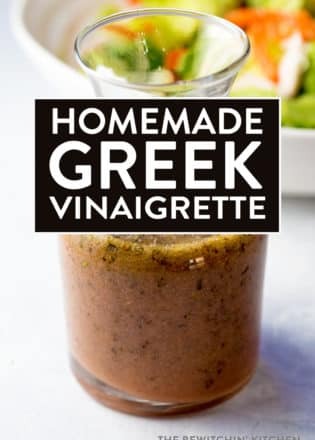 It is so good and no additional spices needed! I love easy meals like that! Yum! This looks so tasty. 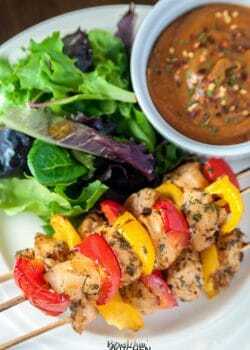 I love making easy chicken recipes and my family loves eating them! These look really good. I don’t think I’ve tried chicken tacos before. I don’t know why, because these sound amazing. I’ll be giving these a try the next time we make tacos. I love chicken tacos. They’re so easy. I’ve never use your marinade though so I’m going to try it. Chicken tacos are the best! 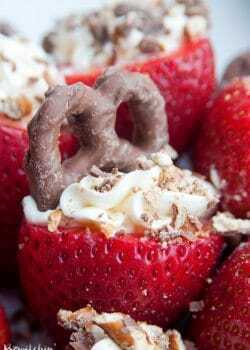 These look super yummy. I’l have to try them this weekend. Thanks Sarah! Chicken tacos are my favorite!